Welcome to the ExPlore page of IFMSA-Jo. Whether you are coming for a clinical clerkship with SCOPE or a research project with SCORE, we believe Jordan will give you the time of your life. Its gonna be Hype! “ Ahlan wa sahlan! Welcome to Jordan! “– This is the greeting that will chant in your ear over and over again in our Lovely country. At least hundred times each day. Everywhere from green hills of the North to the deserted South. Jordan is one of the most welcoming places that you will be visited in the world. Jordanian people take a great pride in their hospitality. Tea and coffee are served in every possible situation to travelers and strangers. It is very common to be invited for meals and drinks by people you have just met on the street a minute before. You can travel all over the world BUT you will not find any country like our hospitality. A well-traveled bridge between sea and desert, east and west, the Hashemite Kingdom of Jordan is a land of mesmerizing beauty and contrasts, from the Jordan Valley, fertile, ever changing, to the remote desert canyons, immense and still. You can explore splendid desert castles, gaze in awe at the haunting wilderness of Wadi Rum, or bathe in the restful waters of the Red Sea. For weather, it is chill in summer and fairly cold in winter. The most distinctive Jordanian dish is Mansaf, consisting of Arabic rice, a rich broth made from dry yougurt (jameed), and most importantly meat . Appetizers (AKA mezze or muqabalat) such as Hummous and falafel, are so satisfying that they could be considered a feast themselves. The authentic Jordanian cuisine promises to satisfy all tastes. The Exchange Committees emphasize on the Academic Quality of our exchanges, as well as the social aspect. Further details can be found in the Exchange conditions and more will be given upon application. Arabic is the official language in Jordan and is used in daily communications, while English is the second language for most citizens. English is the language of studying and teaching at Jordanian Universities and Hospitals. The official name of Jordan is the Hashemite Kingdom of Jordan. The capital of Jordan, Amman, was once named Philadelphia. It was named after Ptolemy Philadelphus (283-246 BC) who rebuilt the city during his reign before Amman was taken by Herod around 30 BC and fell under the influence of Rome. Why you should come to Jordan for an exchange ? Without any doubt our Academic quality is the best in the Middle East, 9.3 from our GDP comes from the medical tourism. Teaching Process in English in all universities. Jordan University of Science and Technology (JUST-LC) rank is 4th in the Arab world and 68th in Asia and 401-500 around the world according Times Higher Education World University Rankings - 2018 and The University rank is 5 stars in QS Stars University Ratings - 2018. Our Social Program won the 3rd place in the IFMSA 67th General Assembly in Egypt. We are the only country of the Eastern Mediterranean Region (EMR) that have SCOPH exchange and it will be in King Hussain Cancer Center (KHCC) which is the ONLY specialized cancer facility in the Middle East. We are the only NMO in the EMR to host all IFMSA Exchange programs, from SCORA X-change to GoSCORP, you name it! Jordan’s healthcare system has improved dramatically over the last two decades, placing it among the top ten countries of the world in reducing infant mortality. In achieving universal child immunization by 1988, Jordan surpassed the average rate of the rest of the world by two years. Jordan enjoys a sound, well-structured health system. It was ranked by the World Bank to be the number one health care services provider in the region and among the top 5 in the world, as well as being the top medical tourism destination in the Middle East and North Africa. Jordan has one of the most modern health care infrastructures in the Middle East. Jordan’s health system is a complex amalgam of three major sectors: Public, private, and donors. The public sector consists of two major public programs that finance as well as deliver care: the Ministry of Health (MOH) and Royal Medical Services (RMS). 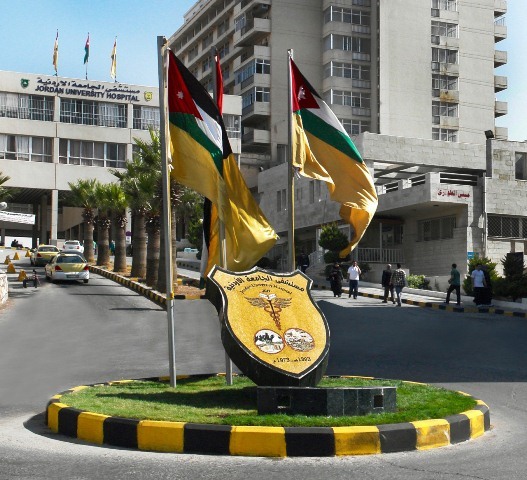 Other smaller public programs include several university-based programs, such as Jordan University Hospital (JUH) in Amman and King Abdullah Hospital (KAUH) in Irbid. The 6-year medical education program in Jordanian universities is divided into an initial 3-year pre-clinical stage followed by a 3 year medical training in hospitals. All of the medical schools in the country have adopted semi-integrated curricula, which involves integrated teaching during the pre-clinical stage and traditional teaching during the clinical stage. In all Jordanian medical schools, assessments at the clinical stage consist of multiple choice questions (MCQ), patient management problems and oral examination. In addition to the other forms of assessment, objective structured clinical examinations (OSCEs) were introduced at in 2007. Exchange students could be placed in Government Hospitals or Private ones. FMSA-Jo will send someone to pick the student up from Queen Alia International Airport (QAIA - AMM) upon arrival. The drive to Amman takes approximately thirty-five minutes, whereas to Irbid it may take up to an hour and a half. In the cities, transportation is mainly by Taxis and ride hailing apps (Uber, Careem). We will gladly offer as much help as we can to ease your transportation during your stay. We also never let our guests leave unsatisfied. You can read about all the places in Jordan from a reliable source (mentioned below) inform us in the first week of arrival or shortly before arrival. We will help you find a safe way to go there. - www.visitjordan.com, website run by the Jordanian Ministry of Tourism, available in multiple languages. More information will be provided to the exchange students after being accepted. - Though most Middle Eastern countries rely on traditions for clothing, in Jordan it highly depends on the weather. - Although Jordan is a conservative country, head cover is not necessary for females. - As part of the Jordanians hospitality, you're expected to accept invites over meals at home and to always finish your plate, we Jordanians love to feed our guests! Hashemite and Mutah Universities place all their incomings in Amman. JORDAN IS A SAFE DESTINATION DESPITE THE CONFLICT IN THE REGION. Decades of political stability and security ranks Jordan as one of the top countries in security worldwide. Jordan has good relations with all its neighbors. It has maintained continuous stability, moderation and security in a region prone to potential volatility. Jordan has an excellent and well-trained police force and military that are, responsive and able to handle almost any contingency. The Kingdom consistently ranks among the safest and corruption-free locations in the world, and in the Middle East particularly. Police forces are widely-spread, police cars and police "huts" are everywhere and they will gladly help you if you ever need them. The Jordanian people are hospitable beyond belief, and are always willing to help a foreigner needing directions or assistance. However, do not accept lifts from strangers. Shopping malls, hospitals, parks, restaurants and cafés are all very safe. It is generally safe to walk and travel around by public transport all day long. At night, it's generally safe because there is no homeless, alcoholics or drug addicts out in main streets. Women are being encouraged to take precautions such as dressing conservatively, not travelling alone and avoid travelling to unfamiliar areas at night and they should always be carrying a mobile phone. Generally speaking, Jordan is a very safe place, major crimes like bank robberies, murder and kidnapping are almost never heard of. So if you keep your money in your pocket and you lock your house at night you will surely be on the safe side. The Jordanian Public Security Directorate (PSD) operates a 24-hour emergency switchboard, which can be reached by dialing 911. You can drive in Jordan using an international driving permit. Make sure you have a third party insurance. Front seatbelts are required by law.